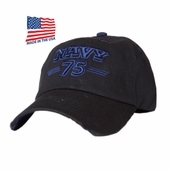 This 100% acrylic six panel officially licensed US Navy hat is Made In The USA! It features an embroidered Navy Text on front. The adjustable slide-buckle closure makes this cap one size fits most.